Just before the time that John Rae brought home to England, in 1854, news of what might have happened to Franklin, the British government was getting tired of searching for Franklin; fortunes had been spent, and ships and men lost. It washed its hands of launching any further expeditions. McClintock and his crew spent the winter of 1858-9 at Bellot Strait, a not-so-wide body of water that separates Boothia Peninsula79 from Devon Island, immediately north of it. (See Map.) That spring a sledging party set out to explore the western extremity's of Bellot Strait where it enters the southern portion of Peel Sound. (They were getting close.) Returning they determined to go forth with a larger group. On reaching Cape Victoria, two groups were established; one under Captain McClintock who was to explore directly south which took in the eastern side of King William Island. 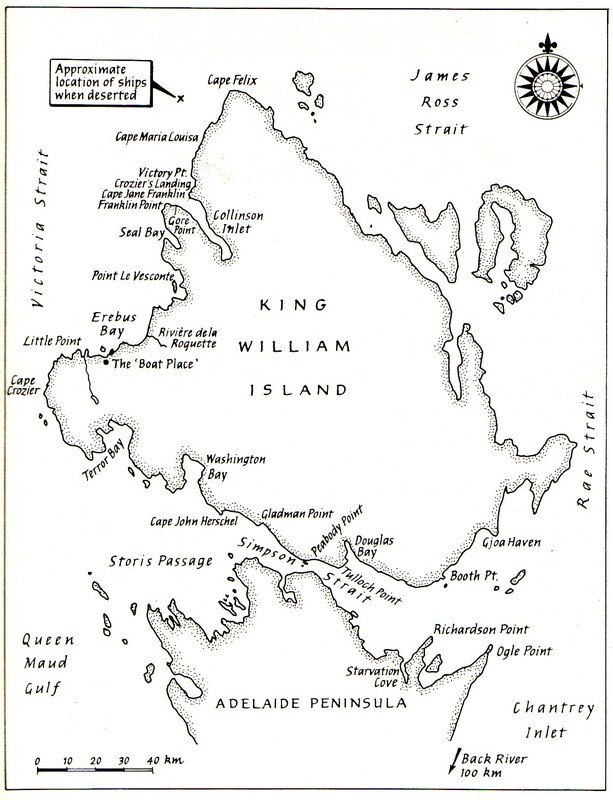 The other group, under Lt. Hobson, headed to the north part of King William Island, so to explore its western side. Of course, and as it turned out, Lt. Hobson's group made some very significant finds, descriptions of which we will come to. McClintock in his different exploratory route, all the way through to Montreal Island, found nothing - though he recovered articles of the Franklin Expedition from the Inuit, so too - their stories. He determined, in his route back to the Fox, that he would follow a route more to the west which would bring him to Simpson Strait, cross it and explore the western side of King William Island, beginning at its southern end. "April 25, 1848. - H.M. ships Terror and Erebus were deserted on the 22nd April, 5 leagues N.N.W. of this, having been beset since 12th September, 1846. The officers and crews, consisting of 105 souls, under the command of Captain F.R.M. Crozier, landed here in lat. 69* 37' 42" N., long. 98* 41' W. Sir John Franklin died on the 11th June, 1847, and the total loss by deaths in the expedition has been to this date 9 officers and 15 men. 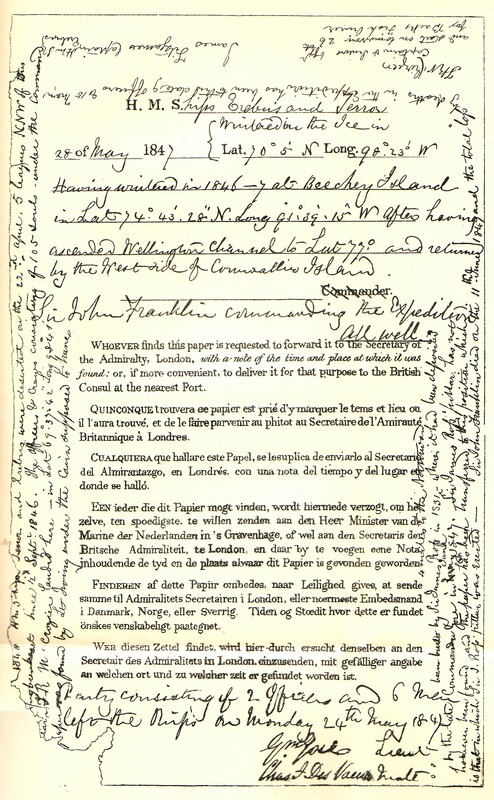 [A footnote shows] ... start to-morrow, 26th, for Back's Fish River." McClintock returned to England in the Fox arriving there in September of 1859. For his discoveries McClintock was feted as a hero; he was to receive honorary degrees and, in 1860, he was knighted.